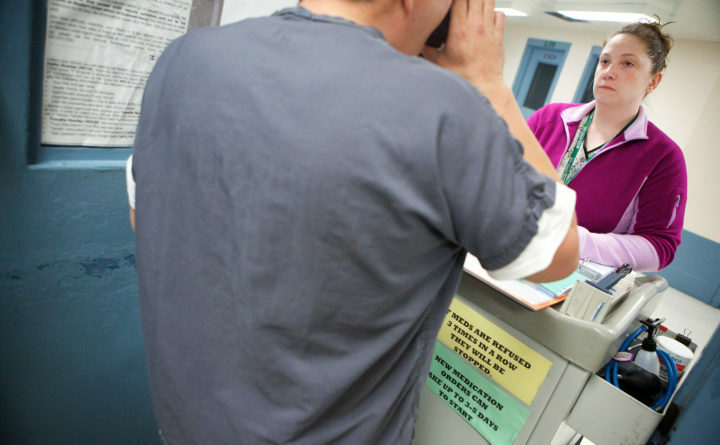 Desiree Fischer, a med tech at the Androscoggin County Jail in Auburn, dispenses the drug Librium to a prisoner withdrawing from alcohol, Feb. 17, 2016. Last June, a 38-year-old man from Bangor described his experience being arrested on a charge of unpaid fines and fees. He spent six days in Penobscot County Jail where he had no access to his regular dose of methadone. “It’s extreme anxiety. It feels like you can’t breathe,” he told the BDN. After he was released, the last thing he remembered was sitting by Kenduskeag Avenue with his hand up, and a car stopping. He had spent the night vomiting, alternating between hot and cold sweats. He could barely hold himself up. Whomever stopped must have driven him to Acadia Hospital because that’s where he woke up. A doctor there confirmed he had passed out and had a seizure. Stopping someone’s recovery cold by not allowing him or her access to prescribed medication doesn’t make sense at any time, let alone in the middle of an opioid epidemic. That is a question Massachusetts is grappling with right now, as the U.S. Department of Justice investigates whether that state’s prison officials are violating federal law by not allowing inmates to continue their addiction treatment medications behind bars. The investigation could have ramifications for prisons and jails everywhere, including Maine. Does prohibiting an inmate’s access to methadone, buprenorphine or naltrexone violate the Americans with Disabilities Act? It’s an important question that the courts may answer in the coming months or years, but Maine prisons and jails shouldn’t wait that long. Taking away someone’s addiction medication doesn’t just tip them into withdrawal, causing nausea, insomnia, muscle and bone pain, cold flashes, diarrhea and potentially seizures, heart problems and breathing difficulties. It puts them at higher risk of relapse. For someone who has taken the difficult but crucial step of entering recovery, jail time coupled with a loss of his or her medication can be devastating. There is evidence that continuing people’s addiction medication, or starting them on it while in custody, can have long-term benefits not just for those with substance-use disorders but also the corrections system. When other states have continued or started people on addiction medication in jail and helped them continue treatment after their release, they have increased the chance people will stay in treatment, and witnessed reduced drug use and drug-related criminal behavior. Treatment is far cheaper than jail, and far more humane. As word spreads about the Massachusetts investigation, prison and jail officials here should band together to create a comprehensive system that supports people with addiction who enter their facilities, and demand the resources to support it. If they don’t do it, lawmakers should compel them. If lawmakers don’t do it, the courts should.